You asked me to describe my school lunches. What did I eat for lunch? This I do remember. Queen Elizabeth School was a mere three blocks from the first home that I lived in. My mother believed in “hot” lunches and children “home” for lunch. It was the 60s, a decade of social and cultural change. JFK, sexism and racism, people were breaking free. I hardly recall a child that stayed at school, on a regular basis, for lunch. There was stability in the west side neighbourhood. Picture this, manicured front lawns, solid, tall oak trees, their boughs reaching out, protecting and canopying the children that played on the boulevards beneath, moms inside, domesticating the home. Occasionally, I would lunch at school. On those days my mother prepared my lunch, carefully packing my new silver thermos into the plaid, tin lunchbox. “Now, be careful with the thermos, Grace! One drop and it will shatter.” The thermos intrigued me with its fat, torpedo shape, gleaming silver shell, catching the rays of sunlight. The lid tightly turned, protecting and chilling the liquid milk inside. It appeared solid, indestructible. Those days, “lunch children” would be sent to the school’s cafeteria, located in the basement of the school. Nervously, I would join the short line and as silent as mice, we would tip toe to the cafeteria, behind our beautiful teacher, Miss MacVicker. Cardigan sets, pencil skirts, kitten heels, she was a fashion icon. I would sit next to my neighbor, Bruce, a scientific, little fellow. I imagine him as a research professor now, searching for another galaxy or discovering a cure for autoimmune disease. Bruce loved dinosaurs and could recite any and all details of their existence! He read encyclopedias. In his basement, Bruce had every model of dinosaur, from ferocious Tyrannosaurus Rex to the smallest of raptors and he could tell you every fact about each type along with every detail of the Jurassic or Triassic period. However, the best thing about Bruce was his chameleon! Imagine living next door to someone who owned a lizard that changed colours! We spent hours experimenting, trying to force changes, the chameleon flicking its long, pink tongue in disgust. Once, I actually thought I saw the reptile-changing colour; its feet turning from green to blue, as Bruce held it captive, wrapped in my mother’s turquoise scarf. “It’s getting angry,” Bruce would declare. Bruce was fascinating, smart and curious, traits I admired. Besides, he had a chameleon! We were children of the Wonder Bread era. Lunch children sat in rows ordered chronologically; youngest students to eldest, tin lunch boxes or brown paper bags, placed in front of our little crossed legs. Napkins placed upon our laps. Quietly, unfolding our wax paper wrapped, Wonder Bread sandwiches, silently acknowledging the day’s fare. “Oh no. Egg salad, again,” would be the lament. Then the sniffing, as we raised the item first to our noses, then to the light, inspecting it with our sharp eyes, looking for bits to toss or avoid. Trades were encouraged. “I’ll trade you a peanut butter for a plain jam.” Buttered bread with sugar and cinnamon sprinkled on top was a coveted delicacy among the young lunch crowd! Tapioca pudding, oh no! “Ugh! Grace eats frog’s eggs!” I would flush with embarrassment. “Fish!” The disgust was audible. We little ones quickly learned that fish was definitely frowned upon. Homemade cookies and a thermos of milk rounded out the meal. Carefully, I unwound the lid and poured the white liquid into the small silver thermos lid. Sipping carefully. Quietly watching the other children. One afternoon, running home from school, my lunch kit came unfastened. The silver thermos rolled out and hit the ground. “Test it,” Bruce declared. “Shake it and listen.” When I picked it up, I knew. When I shook the thermos, I heard the chinking sound of shattered glass tinkling inside the base of the thermos. My mother’s words, “Be more careful! I just bought you that one. Now, you’ll have to do without.” My thermos shattered! The solid, strong, steel like exterior, a false front, so easily broken. Insides made of glass, broken and fragile. Shattered. I preferred to walk home to a hot lunch. It was a reprieve, an escape from the classroom. I took comfort in knowing that I had a house a ‘waiting my return, like a familiar blanket held close to the body, the house wrapped its walls around me, protecting me. Even then, I would imagine returning and the house would have vanished. The panic welling up inside as I pondered my next move. Entering the kitchen, my lunch would be placed onto the table. Campbell’s Tomato Soup, Chicken Noodle, Alphabet, Saltines, grilled cheese, simple fare, repeated throughout the week. Delicious! 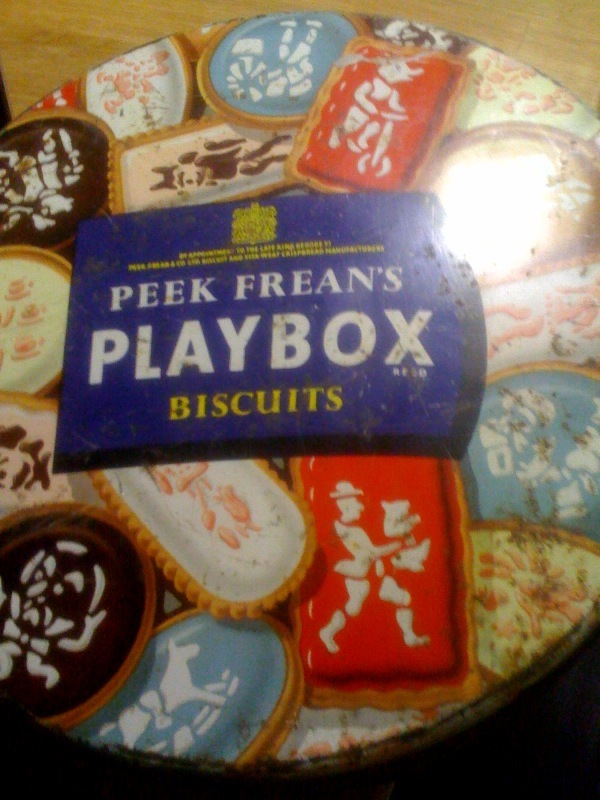 Sometimes Playbox biscuits! “Howdy Doody”  would be on the radio and I would listen with delight when Princess would sing my favourite song, “High Hopes.”  I could picture that little ant pushing that big rubber plant, as I’d sing along with Princess Summer, Fall, Winter. That show was responsible for nightmares for years to follow. The thought of Howdy, Uncle Bob, and Princess actually seeing me through the radio was disconcerting to say the least. Bruce thought that they were probably lying to the children about the seeing part. You asked me to describe what I ate for lunch. It really doesn’t matter. My mother made my lunch. I had a home, my mom, a little sister, and a friend. This much, I do remember. Your post brought back the memory of when I was in grade school, there was one family who lived about 2 blocks from the school who owned a tiny grocery store. In their home they had a built-in deep fat fryer from the store. The kids would go home for lunch everyday (2 boys and 2 girls) and they would come back smelling strongly of hot grease. It’s interesting the memories that are evoked when we share our everyday stories. When I was asked to write about this topic for a class assignment, my thoughts were, What the…?!? The shared responses were amazing, sad, hilarious, touching. Thank you for responding to my post and I am glad that it caused you to reflect on your childhood. You make a very good point. It is interesting in so many ways how sharing stories brings back memories. I think that’s part of the reason why I like to read blogs so much.